The object of my affection was always there…three times a day, every day. Unlike the ability to throw out the last pack of cigarettes, there was always another meal coming. So many times, I found not only was I consuming food, but I was consumed WITH food. Here is share with you how to overcome emotional eating if you struggle with letting go of a food obsession. This post post contains affiliate links at no extra cost to you. See my full disclosure here. My struggle with emotional eating didn’t happen overnight. I got into the habit of rewarding myself with a snack or cheering myself up on a bad day with a bowl of ice cream. Sometimes I would even use food as an excuse to take a break from a difficult task, saying to myself, “A girl’s gotta eat, right?” These actions seemed harmless enough at the time, but before I knew it, food was my comforter, not God. Food had become my best friend. ✅CLICK HERE for my two favorite resources on how to recover from emotional eating. While there’s no doubt that food is good and God created food for our nourishment and enjoyment, a problem occurs when we take pleasure in food more than we delight in Him. God is the only one that can truly satisfy our hearts. He is the provider and sustainer of our emotional well-being so when we seek to satisfy ourselves with something other than Him, we inevitably end up with a bigger mess on our hands (What Are You Consumed With?). Upon entering into a relationship with Christ, one has eternal life with Him, but that doesn’t mean that the ways of the enemy are no longer corruptive and damaging. Like fishing, the bait is enticing but it only leads to destruction. 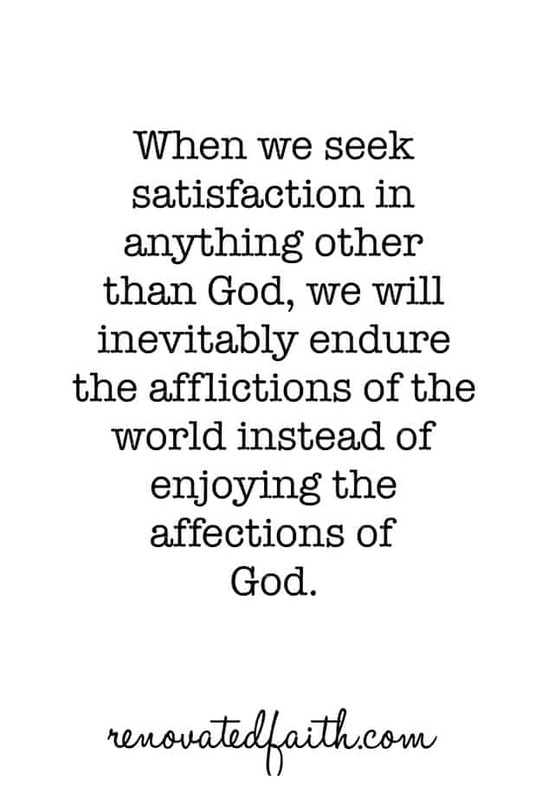 When we seek satisfaction in anything other than God, we will inevitably endure the afflictions of the world instead of enjoying the affections of God. Just like a fish about to be caught by a fisherman, although the bait is enticing it will lead to destruction. Nothing can separate us from the Father’s love but God did not design our bodies to handle sin well. If I ate ravenously upon any moment of emotional discomfort, my health would decline rapidly, not to mention what it would do to my spiritual walk with Him. 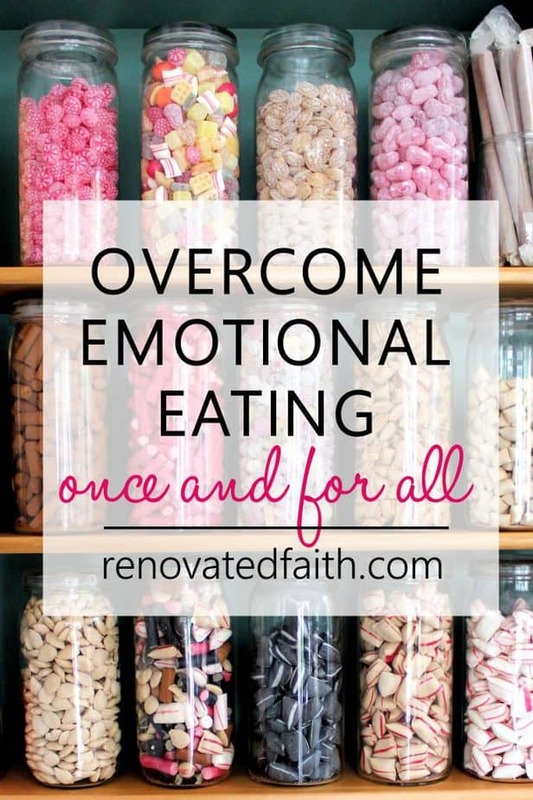 Why Is It So Hard to Overcome Emotional Eating? The way to overcome is “to be dead to sin and alive in Christ” by knowing that the power in you is greater than the power of your addiction (Romans 6:11). This is not just a psychological exercise but know that the One who is in you is greater than the one in the world. We have to fully know and own that truth if we are going to overcome this battle. The Holy Spirit helps us in our weakness (Rom. 8:26) and relying on Him when temptation comes is crucial. We must take our every thought captive and redirect it in obedience to Him (2 Corinthians 10:5). Do not be overwhelmed with the task of overcoming this entire stronghold in your life. Just focus on allowing God to help you defeat the next temptation. The first time will be the hardest. The next time will be a little easier and so forth. Before you know it, a few small steps will become a thousand miles. 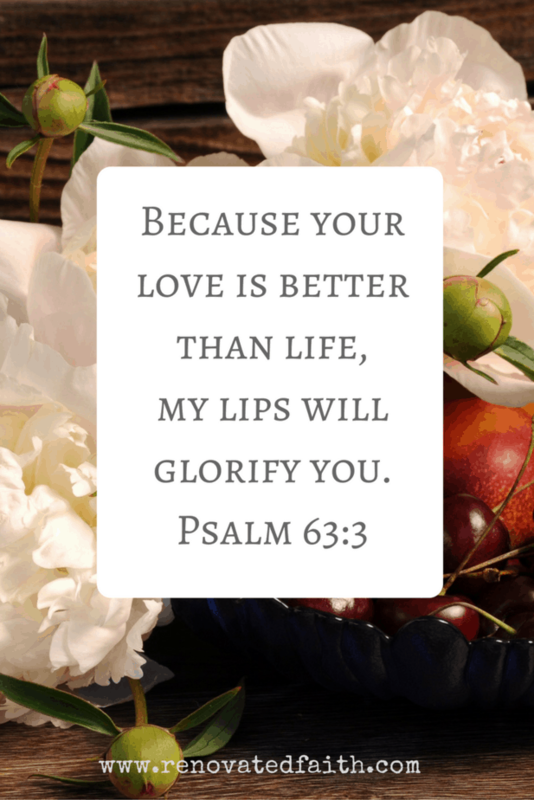 How Did God Intend for Us to Eat? When I could see that God was giving me the strength to overcome this stronghold, I gained a new momentum that could only be from Him. Now my emotional and physical cravings for food are not nearly as strong as they once were. Will we succumb to temptation, allowing it to strengthen the stronghold it already has over our lives? Since relinquishing this addiction to Him one temptation at a time, He has grown and blessed me in ways I never knew were possible. The verse I remember when tempted to go to food for comfort is Psalm 63:3, because the life that God promises in obedience is far better than the destruction that sin disguises. When we look to Him for satisfaction, we find that he not only meets our every need, but surpasses every expectation. My absolute favorite resources for help in overcoming the battle with emotional eating are these from Barb Raveling. 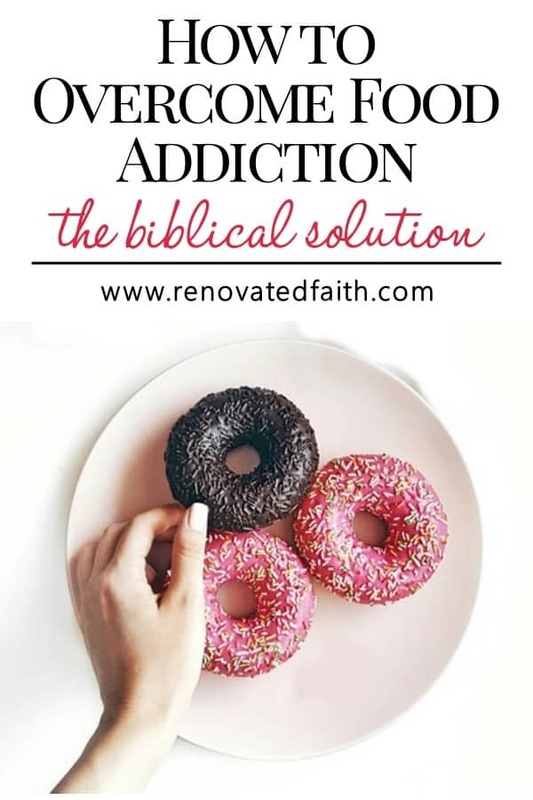 I’ve done lots of Bible studies on the topic of food and emotional eating and hers are my absolute favorites. You can click here to view all of her resources and below are my favorites. Her workbook Freedom from Emotional Eating is a fabulous resource as you embark on this journey. It walks through how to take your thoughts captive and submit them to God one at a time. I cannot recommend it enough as a resource on eating to please God. Second, her book I Deserve a Donut is a resource that chapter by chapter describes the different ways we can struggle with food emotionally such as Boredom Eating, Careless Eating, Bad Scale Eating, Entitlement Eating, Social Eating, Holiday Eating, I’ll Start Tomorrow, Reward Eating and several others. 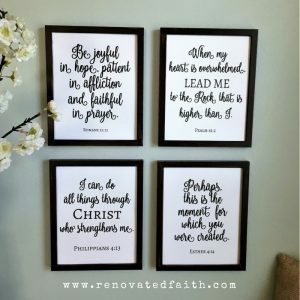 She explains each emotion and then gives a list of corresponding Bible verses for each and helps you identify stress eating symptoms. If you feel this post would be helpful to others, share it on social media. Feel free to comment below with your thoughts and insights. I have struggled with food as well. I think I associate it with love because it was the only form of love I experienced from my mom. I have come a long way but have not overcome this thorn completely. Grateful for the grace & strength of God to keep pressing on. Thank you for you transparency. That’s rough! I think this might always be my thorn. Maybe that’s good as it helps me to depend on Him regularly. Thank you for reading Allie! I think it is such a common and overwhelming struggle. helping you to be transparent. Bless you.